Shout-out to the foley artists on this latest episode of The Flash for their sound work on Rag Doll, our metahuman villain of the week. To get that distinctive crunching every time Rag Doll contorted his freakish terror body, I assume they used... my nightmares? The horrifying psychological shadows buried in the cavernous infinity of my mind? That ancient, primal dread that exists, ineffable but undeniably present, within my very DNA? I’m pretty sure it’s one of those three. Either that or like, crushed soda cans and wet macaroni. Hey, have I mentioned that I have a childhood-deep irrational fear of dolls? To be totally honest, Rag Doll doesn’t factor into the episode a lot as a character in his own right. I think he’s simultaneously the least humanized and most humanized metahuman we’ve gotten in a long time, as he’s completely driven by an emotional revenge, but his behavior, his movements, the way he speaks, all borders on animalistic. His story isn’t framed like the metavillain stories usually are, with a clear-cut motivation and understandable modus operandi, and the mystery of him means he’s a bit like a spider in the corner of a room: lurking, anxiety-inducing, but out of the way. The episode’s real focus is on Iris’s relationship with Nora, and Rag Doll’s past is used to highlight things about said relationship. This is the kind of “filler” episode I love The Flash throwing at us when it doesn’t have anything to say about the main villain of the season, because it keeps the characters’ stories moving even while the season arc is put on hold. 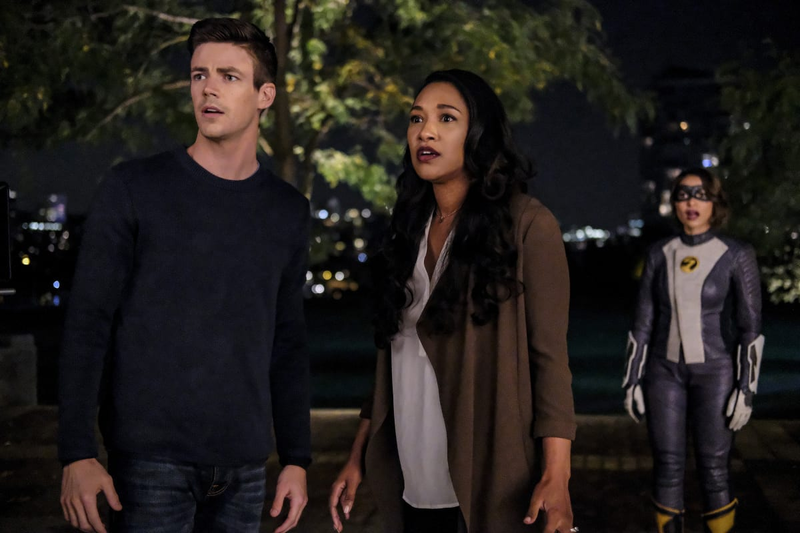 The episode starts when Iris and Barry get an alert that someone’s stolen a Monet painting from a museum (Barry is impressed they were proactive enough to do so at 10 o’clock in the morning). Nora has been ignoring her parents for two weeks, but she shows up during the Flash’s high-speed chase just in time to ignore her mother’s advice and almost get two civilians blown up. When the West-Allen family returns to S.T.A.R. Labs, Nora gets a stern talking-to from her parents, whines like a bratty teenager about how her mom never lets her do anything cool, and flees back to Joe and Cecile’s to do some more bratty teenager stuff. Nora must be in her 20s. Her attitude is kinda embarrassing. Rag Doll makes his first appearance when he steals a couple’s heirloom jewels. He gets spotted by one of them, and the lady correctly labels the whole encounter “terrifying” when CCPD shows up to get the report. I’ll say! Rag Doll can bend and squish himself into small places and open jewelry boxes by smashing his hands paper-thin and sticking his fingers inside. It does seem like a tall tale from a frightened lady, though, so Barry doesn’t fully believe the story until he’s at the scene of Rag Doll’s next victim, where Barry himself witnesses Rag Doll folding through the slats of a vent like the world's worst kind of origami. Unlike the first couple, this latest victim doesn’t just get something stolen — his whole building gets blown up, and Barry has to race him out of the explosion. The guy is an architect who’s incredibly proud of his life’s work, but Rag Doll sends it all up in flames. Much like how the jewels from the couple were heirlooms, the architect’s building was important for more than just its monetary value. Rag Doll is targeting people emotionally more than financially. While still worrying about her fight with Nora, Iris accompanies Barry on an information-gathering trip to a party hosted by affluent Central City resident and mother of our masked metavillain, Theresa Merkel. It’s an excuse for Iris and Barry to get all dressed up and have a lovely, romantic (but brief) dance together in a ballroom. But after talking to the cold and withholding Theresa Merkel, Iris’s heart isn’t in the romantic setting or the two of them finally getting the long-delayed “first dance” of last season’s interrupted wedding. She’s thinking about how Nora sees her as cold and distant, and Iris is afraid the future her might be just as bad a mother to Nora as Theresa was to her now-villainous and emotionally messed up son. Meanwhile, Nora’s hanging out with Cecile, who has made an exchange: for every chore Nora completes, she'll get one story about Barry, except Cecile has secretly been telling stories about Iris instead. Ever since arriving in the present, Nora has stubbornly refused to get to know Iris because she assumes her mother has always been the same as the woman who raised her and getting to know Iris now would be a waste of time. Considering how many cool stories Cecile was able to impress Nora with, this assumption is proven very wrong. Back with Barry and Iris, Iris shares more of her fears about what kind of mother she’ll be for Nora, whether she’s destined to be the kind of mother whose daughter inevitably pushes her away. Iris pushed her own mother away when Francine came back into her life, Nora definitely pushes Future Iris away... but Barry tells Iris that she can change everything, can make different decisions when it comes to raising Nora. Like Cecile’s insistence that Nora learn about Iris as she is now, Barry tells Iris to stop worrying about what the future might bring and to reconnect with the present. After this rare occasion of Barry playing cheerleader to Iris for a change, Iris runs off to follow a lead and Barry goes home. Not sure how Rag Doll has been choosing his victims, but it looks like Barry — or, rather, Iris — is next in line. Rag Doll kidnaps Barry and ties him up on the roof of a tall building, using a pair of pilfered meta-cuffs to make him powerless. Rag Doll’s goal is, as stated previously, to cause emotional pain like the emotional pain he lived with throughout his life, being raised by a cold-hearted mother. He wants to cause the same pain in Iris by killing Barry. When she shows up with Ralph, Iris immediately gives in, but Rag Doll pushes Barry off the building anyway. So Iris straight-up dives off the building after him so she can unlock the cuffs and save both their lives. Iris West-Allen is freaking amazing, people. Nora witnesses her mother saving her father via the most awesome and reckless thing imaginable, and the seed of “maybe Iris is cool after all” planted by Cecile’s stories fully sprouts. It gets even better when Iris tells Nora that she’ll answer all the questions future her considered off-limits, that there’s no reason why Nora shouldn’t be able to get to know present-day Iris. It looks like the burned bridges between mother and daughter are finally being rebuilt. The other character-driven plot going on this week involves Cisco and Caitlin trying to track down Caitlin’s dad, with the help of Ralph and Sherloque. I guess the team is taking a brief breather from tracking Cicada, which, like I said, is perfectly alright by me. The show taking a handful of episodes out of the season to put the season plot on pause while they build characters is not only okay, but commendable. Especially when they manage it as well as they did with this episode. Cisco, hoping to remain useful despite the injury done to his hands (and his powers) by Cicada’s blade, has been overtaxing himself by vibing clues to Thomas Snow’s whereabouts and keeping his pain secret. He doesn’t want to be useless by being powerless, which clashes with his initial negative feelings about having powers at all. Caitlin, with her Killer Frost journey, can relate. But, she informs Cisco that there’s no way he could ever be useless — that he’s a genius in his own right, without needing powers to help the team. He proves this at the end of the episode by jumping onto four of the satellites DeVoe launched into orbit during his world takeover last season. Cisco takes control of those satellites, finally putting Team Flash back online and giving them a fighting chance at tracking down the shards from the meta-empowered satellite... and tracking down Caitlin’s father. Next time: we meet up with Caitlin’s dad! Will it be another good character-driven episode?